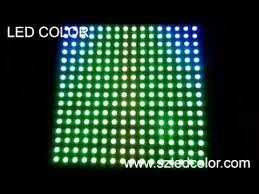 In this project, 8 LEDs are connected to PORT B of a PIC microcontroller. Also a push-button switch is connected to bit 0 of PORT A using a pull-up resistor.. When the switch is pressed the LEDs scroll to the right. The circuit diagram of the project is shown in Figure 1. The circuit in this project additionally a switch is connected to bit 0 of PORTA to control the direction of scrolling. 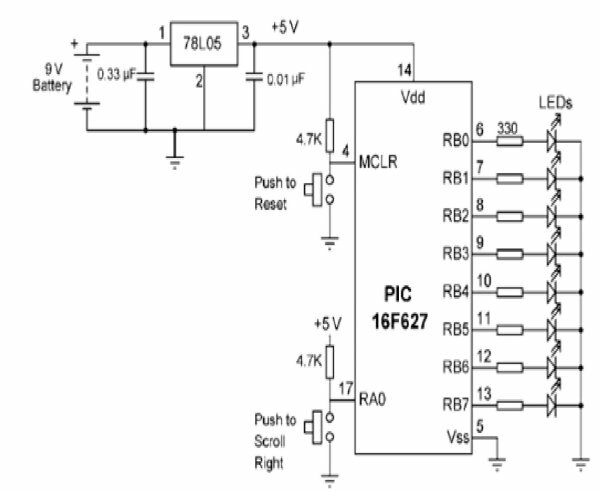 A PIC16F627 model PIC micro controller is used and the micro controller is operated from its 4 MHz internal clock. The LEDs are connected to 8 pins of PORT B using 330_ current-limiting resistors. An external reset button is connected to MCLR input of the microcontroller. The flow diagram of the project is shown in Figure 2. At the beginning of the program the I/O direction is specified. A byte variable called Cnt is used as the loop variable. The program consists of an indefinite loop and at the beginning of the loop the switch is tested. If the switch is logic 1 (i.e. switch is not pressed) then the scrolling is to the left and if the switch is pressed the switch is at logic 0 and scrolling is to the right. A 250 ms delay is used between each output.